Crickett’s Answer, a 501(c)3 nonprofit organization founded in memory of Crickett Julius, has just joined forces with LympheDIVAs to help other breast cancer survivors who fight not just the beast that is breast cancer but also the fallout of side effects that includes lymphedema, which may limit survivors’ activities. LympheDIVAs began in Philadelphia when two young breast cancer survivors, Rachel Troxell and Robin Miller, developed lymphedema, a side effect of breast cancer treatment that can cause permanent swelling in the arms. Their physicians and lymphedema therapists recommended a compression sleeve as the most effective way of controlling the swelling. When they researched the options for the sleeve they found that the only ones available were rough textured, heavy, hot, beige, and bandage-like. Frustrated and dismayed over the lack of options they had for compression sleeves, Robin and Rachel met with Kristin Dudley, a fashion designer, to discuss their idea of creating a more elegant and comfortable compression sleeve. My friend Susan, played matchmaker and connected these two amazing resources. Now, lymphdema sleeves in floral, lace, tattoo and other designs or skin tones are available–at no cost–to women who can’t afford them through Crickett’s Answer! All this culminated on the very week Susan learned she has a fourth cancer/recurrence in less that four years. What is the lymphatic system and lymphedema? The lymphatic system is structured like a web, occasionally draining into small lumps or nodes that filter the lymphatic fluid. The system works through the pumping power of the body’s muscles. The muscles contract, increasing pressure within the lymph vessels, which causes the fluid to move. A series of one-way valves ensure that the fluid moves in the right direction. Lymphedema, the build up of protein rich fluid in the subcutaneous interstitial compartment occurs when either lymph fluid is impeded from flowing through the lymph vessels and lymphatic system or there is an excess of fluid that exceeds the carrying capacity of the lymph system. It collects in the subcutaneous and deep tissues causing swelling of the affected area and predisposes to chronic inflammation. 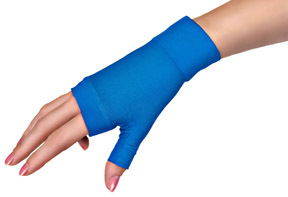 What are lymphedema armsleeves and gauntlets? Lymphedema is managed and treated through a variety of therapies. Compression armsleeves and gauntlets are one such therapy. LympheDIVAs armsleeves and gauntlets are Class 1 (20-30mmHg) and Class 2 (30-40mmHg) medical devices. Like other armsleeves they utilize graduated compression, the highest pressure is at the wrist and acts as a pump to encourage the lymph vessels to push the lymph fluid toward the body. Although lymphedema sleeves are medically necessary, they are not covered by Medicare OR most insurance plans under current law, and thousands of survivors go without the sleeves, needlessly suffering congestion, swelling, and pain that interferes with their normal activities. To ask for help, please download and complete the forms at Crickett’s Answer, writing in “lymphedema sleeve and gauntlet” on page 2 of the application. Here’s the link to donate to Crickett’s Answer to Cancer. And please share, or recommend Lymphedivas products to your friends, physical therapists, doctors, nurses, mothers, sisters, daughters and wives, or send them a note of thanks for sharing their wonderful products with those in need. To help or raise awareness, please feel free to copy, tweet, or link my post on your blog, Facebook page, email lists, or print it out, stick it into an envelope and mail it to a friend. Send it to your favorite local newspaper, journalist or social media outlet. And ongoing never-ending thanks to awesome Susan for connecting these resources to each other and once again, sharing news, hope and awareness with us! This was awesome, Jane. Thank you for this — and for explaining how it works! Thanks for inspiring me to find out what I didn’t know about Lymphedema Sleeves, and share with others who may not know either. Sorry, I see the non-profit I mentioned when I wrote this in 2011 has shut down due the old age of the women who ran it. Sorry, and good luck!